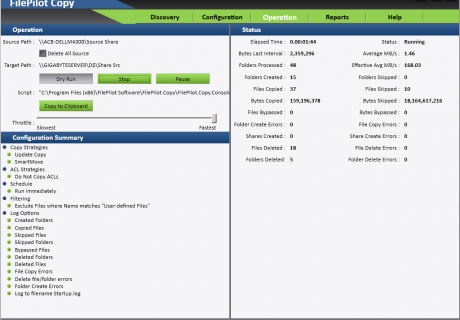 FilePilot Copy is an innovative data mobility solution that helps enterprise IT teams responsible for data and storage to intelligently control and manage the movement of unstructured data. 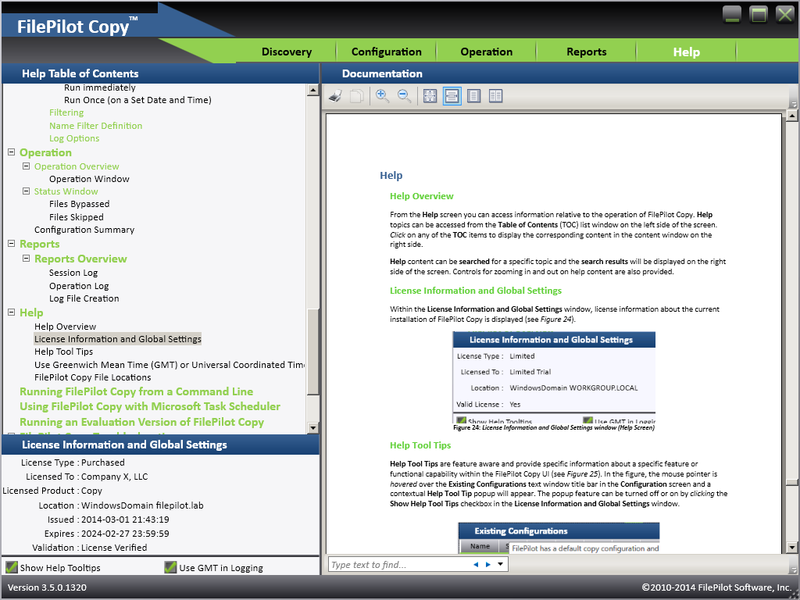 Designed from the ground up to enable quick implementation of data mobility initiatives of any size or scope, FilePilot Copy transforms how unstructured data is moved within a data center or across a country. Enterprises adopting an Intelligent Data Mobility™ strategy can position unstructured data where and when it needed, improving their ability to respond to changes in organizational and business needs. Without a consolidated view of where and how unstructured data is stored, it is difficult to achieve effective management and governance. Add over 600% growth into the mix and the difficulty increases exponentially. FilePilot Copy automatically discovers files, folders and shares on individual systems with a simple click, eliminating the need to manually document file systems. 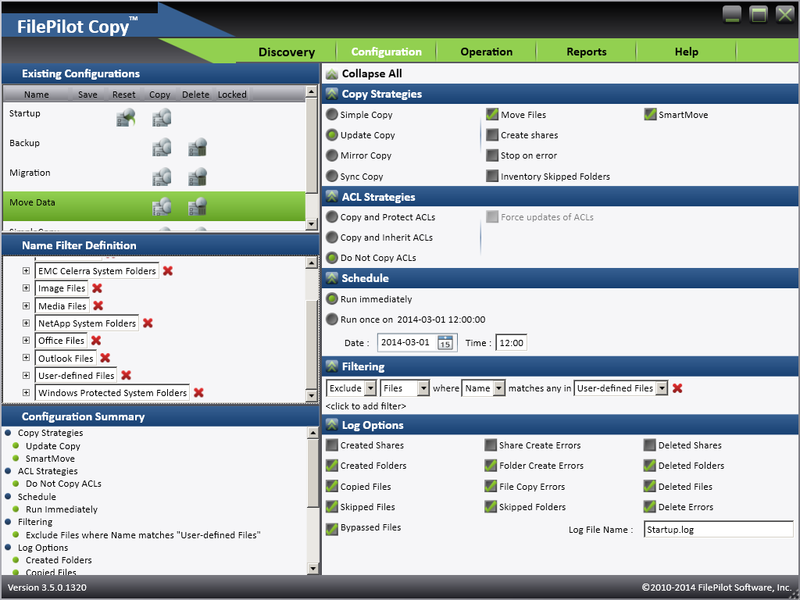 Accelerating the discovery process, Express Discovery™ simultaneously finds and displays all NTFS and CIFS compliant servers and storage. 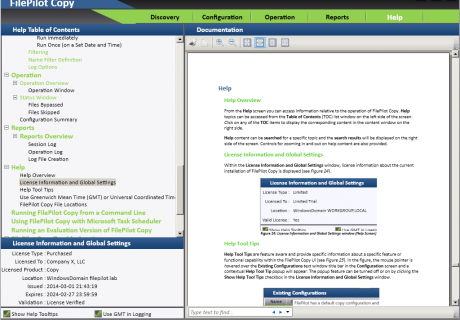 Instead of physically accessing each component of the storage infrastructure individually and assembling the information by hand during a pre-move assessment, data management teams can access FilePilot Copy's consolidated discovery information, in a single place. Improved insight into their unstructured data allows them to assess data importance and its composition. This insight speeds up identification of the data to be moved, determining the unstructured data that should be preserved or purged and guides positioning (hot, cold or archive) in the appropriate tier. Merging file systems and moving data is part art - part science. White-boarding the ideal structure can take days or weeks to complete, depending on the amount, structure and complexity of unstructured data involved. A solid design relies on a pre-move assessment that is 100% accurate. Any flaws in or information missing from the assessment can be introduced into the design and may not detected until after data is moved. 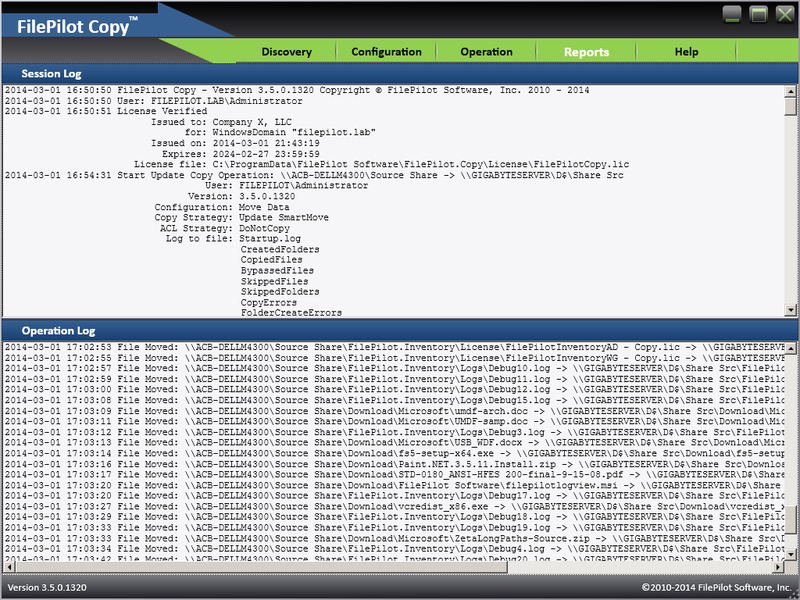 FilePilot Copy's visual drag and drop design model ensures that unstructured data is properly merged and precisely positioned on the target, before a move occurs. As part of the data migration process, a verification is run as a manual post-move operation. 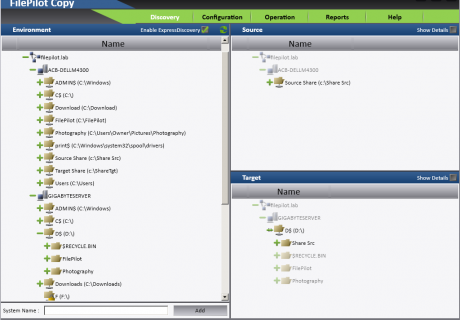 After the initial migration is complete, the target system is logged into remotely and file system examined to ensure that it is as designed and the unstructured data is in place. Instead, FilePilot Copy eliminates the need for a separate verification stage and moves it forward as part of the pre-move design stage. Immediately after a merged file system design is defined it can be verified in a dry-run operation before moving data. While the movement of unstructured data onto upgraded or new storage is the least complex stage of the data mobility process, it takes the most time to complete. 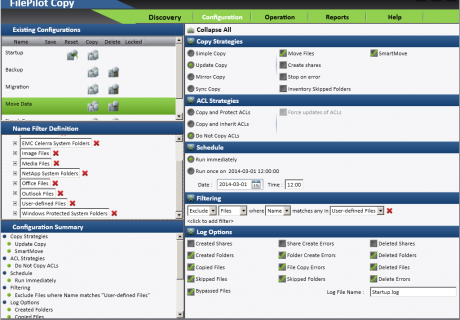 Rather than accessing the source and target systems to understand if a data move operation is running smoothly, FilePilot Copy's operational dashboard tracks 20+ parameters in real-time and displays the status of data as it is moved. 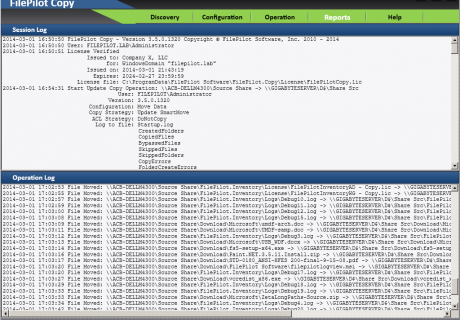 Post-move cleanup requires analyzing log files to identify any bypassed or open shares/folders/files on the source system not moved or were inaccessible for any other reason. Any transactional or event information not captured in log files compromises the ability to locate problems and determine their significance. FilePilot Copy's non-blocking architecture guarantees that every single transaction and event that occurs during a move operation is captured. With complete information available issues can be identified and resolved faster, preventing costly delays. 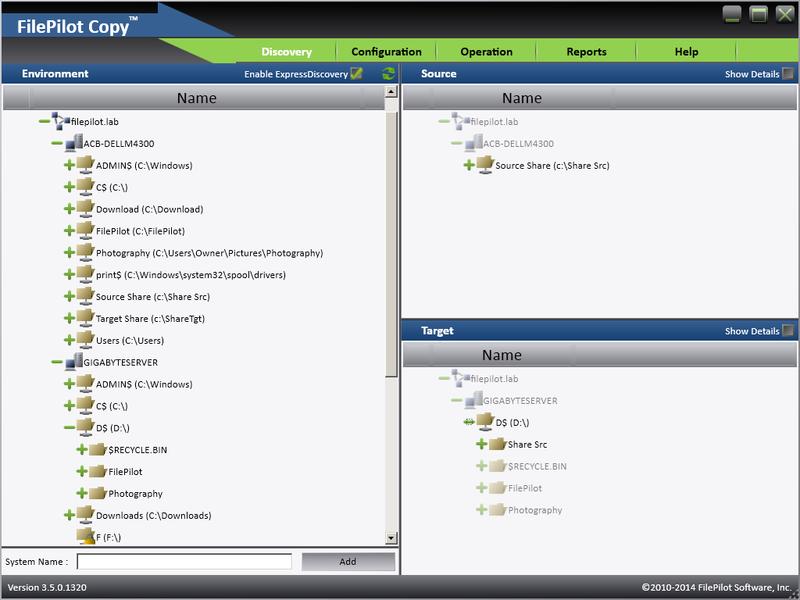 A final move operation is run to address bypassed or open shares/folders/files that are required to be on the target system. Synch is the final operation that moves data between the source and target. Since the source is still accessed by end users, any changes to shares/folders/files occurring after the final cleanup move have to be applied to the target. Usually run during scheduled maintenance or over a weekend, a Synch has to be completed in a very limited window. For very large file systems, 20+ terabytes, it is normally run over a series of weekends on incrementally smaller changes. Taking advantage of patent-pending processing algorithms, FilePilot Copy can run and complete a Synch operation 800% faster than traditional data migration solutions. After the final Synch is complete, the upgraded or new systems and storage can be brought on-line and the outdated or off-leased systems can be decommissioned. Increased mobility of unstructured data available through FilePilot Copy provides the ability to move from outdated or off-lease systems faster to reduce the time those systems are required to run in parallel and decreasing the sitting time between provisioning and end-user access.